British psychologists have published research findings which they believe go some way towards explaining why people think they see or feel ghosts. The study - in which hundreds of volunteers were taken around two allegedly haunted locations - found that people reported having more unusual experiences in the specific places at each location which are considered most haunted. The researchers think this can be explained by the way people react to environmental cues, such as subtle drafts, and in particular visual factors, like low lighting. 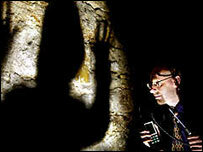 The research also threw up evidence suggesting a link between magnetic fields and ghostly sightings. At both Hampton Court Palace, in Surrey, and the South Bridge Vaults in Edinburgh, the variance in local magnetic fields was highest in the areas thought to be most haunted, and lowest in areas where people typically did not record experiencing ghostly phenomena. The variations in magnetic fields were incredibly small - about 100 times less than you get from sitting about a metre away from your TV - but the researchers think the findings are significant. 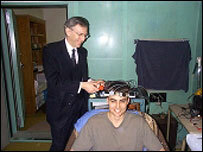 "The correlations between ghostly activity and magnetic variance were relatively large and tie in with laboratory findings that suggest varying magnetic fields have a measurable effect on human physiology," said Dr Paul Stevens, of the Koestler Parapsychology Unit at Edinburgh University, who obtained the magnetic field measurements at both sites. Some studies have previously shown that variation in normal electromagnetic (EM) fields, when applied to certain parts of the brain like the temporal lobes, can result in experiences from the physical, like being touched, to the metaphysical, such as feeling close to God. "When the shapes of these magnetic fields are reproduced in the laboratory and generated across the brains of volunteers 'the sensed presence', fear, and other experiences are reported," said Dr Michael Persinger, of the Laurentian University, Ontario, Canada. "However, both in the field and in the lab, the details of the experiences are strongly affected by the expectations of the subject as well as their sensitivity to the EM fields." A professor of neuroscience, Persinger's results are very similar to those just revealed in the UK by Dr Wiseman and his colleagues. "When we measure houses where pervasive haunts occur, the place where the occupants find they can sleep, by trial and error, has the most consistent and normal field strengths," said Dr Persinger. "The high-density haunt areas, usually not more than about one or two metres in diameter, are very electromagnetically noisy." So does this mean that ghosts don't exist at all? "A likely explanation is that the 'ghost' component is primarily derived from the direct effects of the stimulation of the natural physical events upon the observer's brain," said Dr Persinger. "However, science is the pursuit of the unknown. There may be stimuli present we still have to measure." Not everyone is so easily convinced, and they point out that the magnetic field variation results do not explain every ghostly phenomenon. How for instance, can groups of people perceive the same ghost or feel the same presence, when hallucinatory experiences are typically individual and very subjective? Tony Cornell, author and a paranormal researcher for over 50 years, thinks there is some way to go. "Since 1852, science has been trying to find an easy answer, and it would be nice if we had a simple answer but we do not; the magnetic wave theory is too simple." A vice president of the Society for Psychical Research, based in London, he points out that the same apparitions revisit many haunted sites - something not predicted or explained by the magnetic wave theory. "I'm not going to say they haven't got the answers, but these experiments seem to be one-offs," Tony Cornell said. "We need more repeatable answers. Scientists can switch lights on and off, but can they switch the ghosts on and off? No they can't." His own experiments on magnetic fields have yielded mixed results, though he remains optimistic that the answers are coming. "We persevere. The answer will come eventually. An open mind is what is always needed." The research conducted at Hampton Court Palace and the South Bridge Vaults is reported in the British Journal of Psychology by Dr Richard Wiseman and colleagues. "The aim was to find out why people believe they can feel a presence in particular locations"